The back story. I am that guy (possibly not the first) who sat in The Claremont Pub, in Moss Side, Manchester and told family and friends “I’ve got a great idea, let’s make cider in Moss Side and call it Moss Cider”. Months later there I was carting around a 20lt screw press, a scratter and as much head knowledge as possible. Thanks YouTube! To be honest that first batch was damn tasty and so the thoughts of scaling up escalated for the 2011 season. It was in that year that I met Joe Weeks, a Northern Quarter dweller and a green fingered one to boot. We had a lot in common and more than that he had offered the project a free commercial cider press. I knew I had to woo him into business. Joe hasn’t always been the face you meet and he’s worked more behind the scenes but he’s been an integral part of Moss Cider’s growth over the last seven years. It’s now time for one of us to take things forward and after much consideration on both our parts I’m the one that has decided to step aside. As a family we moved away from Moss Side in the summer of 2016. It was a hard decision but what many do not know is that our second child, the aptly named Rufus Pippin, was born with a very rare genetic condition called Angelman Syndrome. It’s meant a lot of change for our family and we’re now settled in Woodley, Stockport. Closer to family in Glossop and now thanks to Stockport council gaining the necessary adaptations we need for Rufus. Where’s Nick Knowles when you need him eh? Trust me, we tried the DIY SOS route, no reply. I jest but we can genuinely say we love life here. Canals and panoramic views of Greater Manchester and a massive back garden that’s crying out for an orchard. So my orcharding adventures may have begun in IBCs on the former bus depot in Moss Side but you see all this messing around with apples led me to the fantastic charity The Orchard Project who I now work for three days a week. A fantastic job where I get to plant and restore community orchards and plan bespoke events in the parks and green spaces across Greater Manchester. I love it and I’ll be calling on Joe in the future for bar related work, so watch this space. So it goes without saying that I owe a massive debt to Joe but also to all those apple donors, drinkers, volunteers and suppliers who have sustained the project. 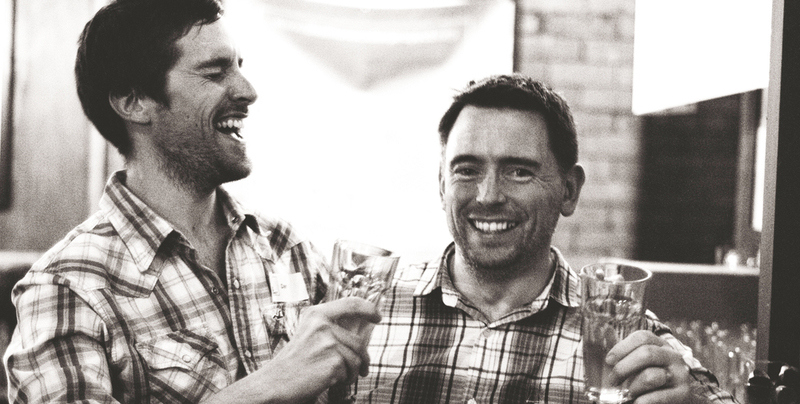 You helped us become one of the country’s flagship community powered cider projects with requests coming from far and wide for advice, help and support. Without you the project wouldn't exist. I’m not sure what I’ll miss the most, will it be that overpowering smell of fresh apples as you open the cider house doors a week after cramming it full of fruit? The craziness of a pressing day or that first taste of fermented cider after its sixth month maturation? To my knowledge we’ve never had a bad batch. Well, there are those two barrels of Granny Smith apples that were headed for the giraffes at Knowsley Safari Park. “Joe, those are still in deep storage, right?”. I won’t miss the late nights, the aching backs, the spilt juice, the broken pumps or the long bottling days. But there are so many great memories from the last 7-8 years and I wish Joe and the future team he builds around him every success. They say it takes a fruit tree seven years to reach maturity. So if Moss Cider were a mighty Kingston Black it’s now ripe for the picking. So it’s goodbye from me and as my good friend Gabe Cook (The Ciderologist) would say “Wassail” my friends, “Wassail”.